A very simplistic Theremin, using only one 4069 IC. 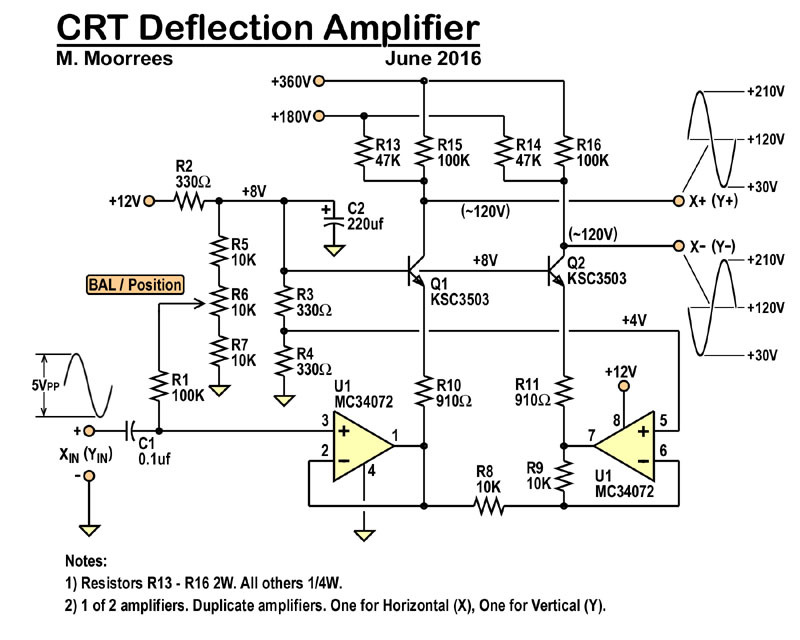 The reference oscillator uses a 455KHz ceramic resonator, and the varying oscillator uses a tunable 455KHz IF can. The beat frequency is demodulated an amplified before being fed to the speaker. Neon bulbs halves modulate alternately with ambient sound. Can use any neon, but better with ones with electrodes of which either can be anode or cathode. Makes the HV voltage needed to run an old phototube. These tubes use only a few tens of microamps, so the 2N5401 is plenty good for the job. Use the op-amp type shown. If you’re going to sub it, then use a ST TSH22. An LM358 is way too slow. The TSH22 and On-Semi MC34072 are both “single-supply” op-amps, and have high slew rates needed to operate this circuit. Click Here to see a video of it in operation. The pulses are from the remote control, its detecting. Need to run a few new super bright LEDs, from a low voltage source. This will do it using the old reliable MC34063 switching supply chip. Modern GaN superbright LEDs (White, Blue, and true Green), run at higher voltages than the red and yellow LEDs. Often as high as 4.5V. That gives you little head room, if you want to run them off a 5V supply. Using this circuit you can tie a bunch of them in series, so they’ll all get the same current. Tie as many together, as long as the total voltage drop is less than 40V, the MC34063 limit. The circuit is rigged to regulate current, not voltage. That’s what makes LEDs happy. As shown, that current is 18mA. A safe value. The circuit will regulate to 18mA, and the voltage at the top LED will be whatever it needs to be to get 18mA thru. Get +12V and +200V from a 6V “gel-cell” (sealed lead acid) battery. You MUST use an MC34074 quad op-amp, for this to work ! Parts like the LM324, LF347 or TL084, will NOT work. The LM324 is too slow. The MC34074 can swing all the way to ground, like the LM324, but its as fast as the LF347 and TL084. The LF347 and TL084 can not swing all the way to ground. There’s this thing “specmanship” when it comes to datasheets. Op-amps have this thing called “gain-bandwidth-product”. That’s the frequency, where the op-amp’s gain is one (unity). Its a useless number. All the verbage in the first two paragraphs of most datasheets is useless, if not deceptive, marketing garbage. The real, useful data is after that, and needs someone with training and experience to properly make use of it. A LM324 may have a gain-bandwidth-product of 1MHz, but as a full-swing (rail-to-rail) oscillator, it can’t go much faster than 5KHz. Click Here to listen to a short audio clip. Note: U1, a 4N35 opto-coupler, isolates the telephone circuit, from the 120VAC line circuit. J1 is an RJ11 modular telephone jack. The center-most two pins are to be tapped on this RJ11 jack. If wires come out of it, they are colored red and green, by convention. Here’s is the link to the video, to see it operation. It emits a bit of UV, so take care, when viewing a real tube, lit. On the other hand, the actual volatges are quite low. Nothing over 30V, or so. Ironic for a tube capable of rectifying 2500Vrms ! The circuit uses a TL494 chip, rigged so the 2 outputs switch ON, complimentary to each other (one ON, while the other is OFF). The chip drives two power FETs that route current into a transformer, in the classic push-pull arrangement. The transformer is a ferrite toroid with a center tapped primary (20 turns + 20 turns, 40 turns total), and a secondary of only 4 turns. On the input, only a ~1.3 amp is drawn, while the secondary delivers 5 amps, at ~2.5Vrms. The switching frequency is ~30KHz. A side benefit, is that the primary has a little “flyback” transient, that can be tapped for the ~30V plate voltage for the tube. With the parts shown, the plate current is ~60mA, so common 1N914 diodes can be used, instead of the MBR160 Schottky rectifiers. Note: both of these diodes (1N914 & Schottky) can switch at nanosecond speeds. Your crappy 1N400X cannot, and should never be used in a switching supply ! Even though that output transformer is tiny, the bottom doesn’t roll off until just under 90Hz or so. 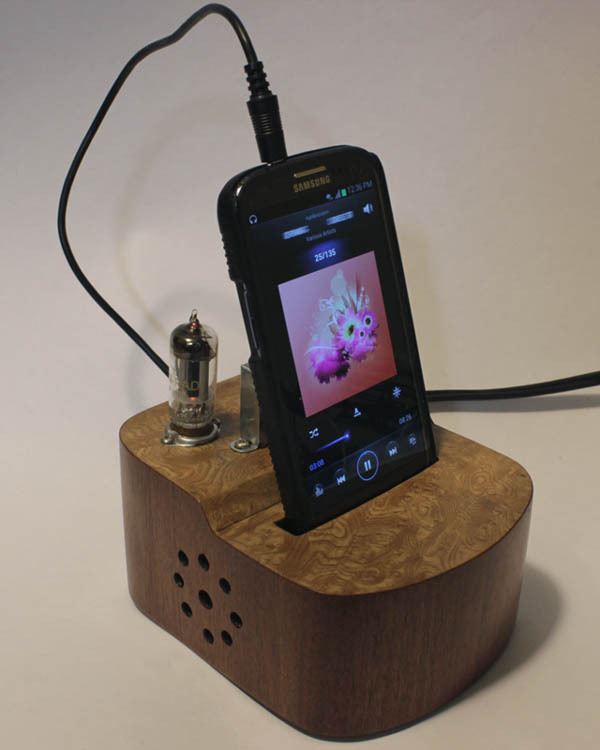 Its feeding two 4 ohm, 2″ speakers, so don’t expect great bass response. It does sound a lot better than the phone alone. And it sounds better than most docks I’ve heard in stores. Plus how many docks have you seen that are made of wood !? 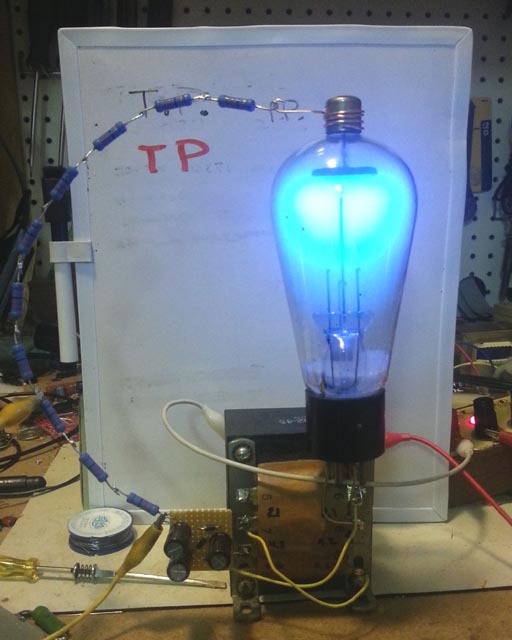 The circuit is a modified MC34063 nixie power supply. The inductor has been replaced with a transformer, with a 20:1 turns ratio. The circuit generates 300Vpp of pulsed DC at the primary. Only the time varying signal gets transfers over to the secondary, and multiplied by 20, as ~6KVpp. The frequency is roughly 30KHz, but its anything but a sinewave, so the a lot of higher frequency harmonics. 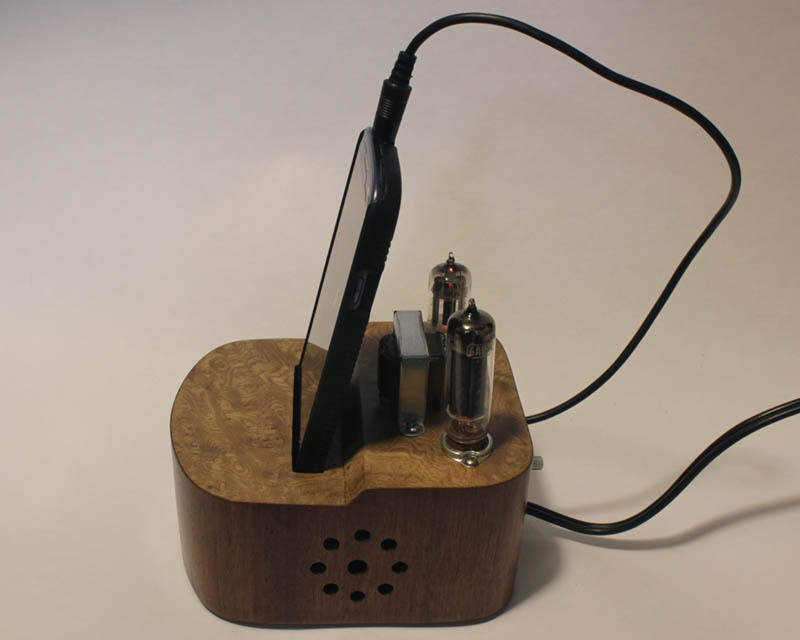 A quick solid state audio amp, when you need amplify a drive a speaker. It uses a National Semiconductor (now TI) LM1877 stereo 1W amplifier chip, hooked up in a bi-phase arrangement, so the output voltage swing can be near twice the supply voltage. Remarkably, very good audio quality, for a single chip amplifier, that delivers less than 10W. No hum, noise, or noticeable distortion. Like all joule thieves, it boost the voltage from a single 1.5V dry cell battery and boosts it high enough to light new ultrabright GaN, blue, green, or white LEDs. But instead of requiring a custom coil, it uses an off the shelf standard Kemet SU9H-07010 (1mH) common mode choke. Some added features, in addition to the coil choice: (1) a PNP transistor. 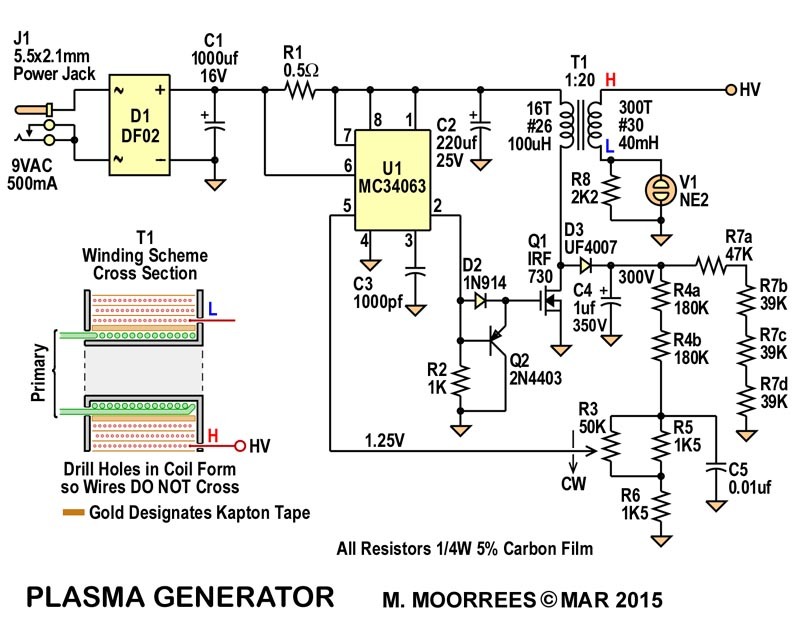 With a silicon transistor, this circuit can run on a battery as low as 0.7V. Germanium transistors can even operate lower. As low as 0.25V. When germanium transistors were common, they more often than not came as PNP. NPN germanium transistors were harder to make. (2) a voltage doubler rectifier, and filter circuit has been added. Usually the LED is just placed across the pulsed output. This wastes half the signal. This doubler circuit, uses the whole AC pulse generated. To waste even less, BAT43 schottky diodes are used. Even though common 1N914/1N4148 diodes will work, the BAT43, will squeeze out another half volt. Jig for testing old voltage regulator tubes. These are the tube version of zener diodes. and have numbers like 0A2, and 0B3. The leading character is a zero, not an “o”, but in the days before personal computers, “o” and zero, where regularly interchanged, in informal conversation. With parts shown, tested to have bandwidth of ~200KHz. 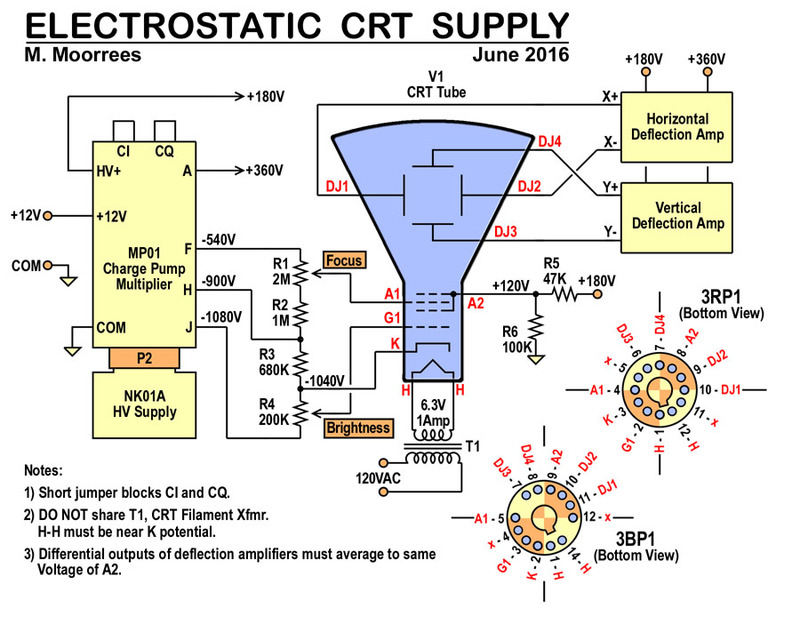 Can be used as part of solid state analog scope (using old CRT tubes), along with this HV kit. As shown, you’re stuck to the AC line, since the filament is powered by a 120V to 6.3V filament transformer. Why not just connect the filament to the 12V, with a limiting resistor, or 6V regulator, you say ? Can’t, its not that simple. That filament must not stray too far from the cathode potential. Even though the cathode (K of the CRT) and its filament (H-H) are isolated from each other, the voltage between them must not differ much more than ~100V. If it does, current will arc across the small gap between them. 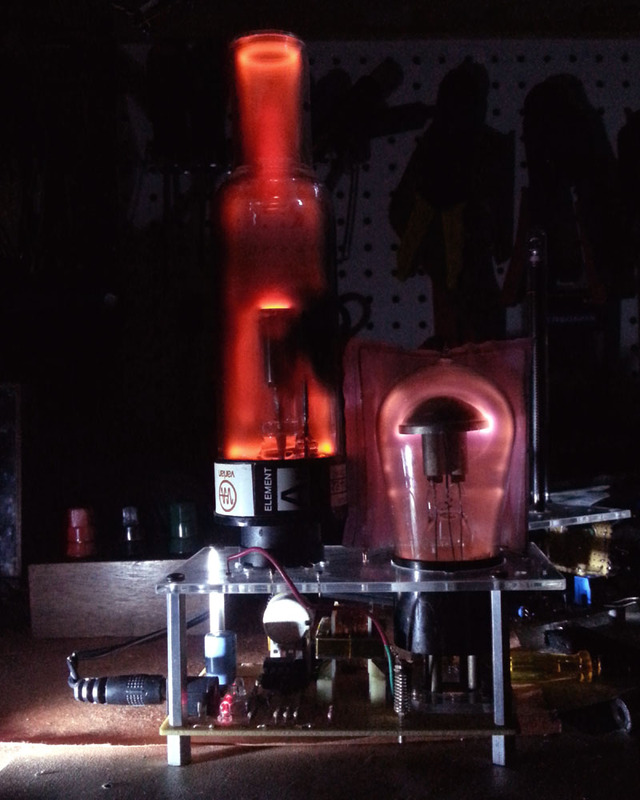 That cathode is more than a 1000V negative relative to ground (circuit common), and the low 12V input. This circuit’s function is to power a 6.3V filament, yet be electrically isolated, from primary to secondary, in excess of 1000V. The two windings are electrically separated from each other, and power is transferred thru the shared magnetic field. The transformer core is a small half inch diameter ferrite toroid. To enhance electrical isolation, the core is to be wrapped with several layers of Kapton tape (5mm wide), so that voltage does not arc thru the core, from primary to secondary. Royer circuits, like this have been used commonly, for induction heaters, so they can transfer a lot of power. This circuit has been tested to deliver over one amp, with little voltage drop, and the transistors staying cool. The components that do warm up, are the transformer, and C1. Use a film cap with very low DF. Possibly even a foil cap. 250V rated or higher. Oscillator frequency is in the ballpark of 50KHz. Above, is the basic circuit required to run an IEE Nimo tube. This is a specialized CRT tube with 10 shadow mask grids. 9 of the 10 are to be negatively biased, relative to the cathode filament, so that electrons are blocked. Only 1, at anytime, is to be biased positive, allowing the electrons to flow thru this selected grid mask, forming that particular numeral, on the anode screen. Grid drive is small, relative to the cathode. -4V to +4V minimum, so common 4000 series CMOS chip can be used. 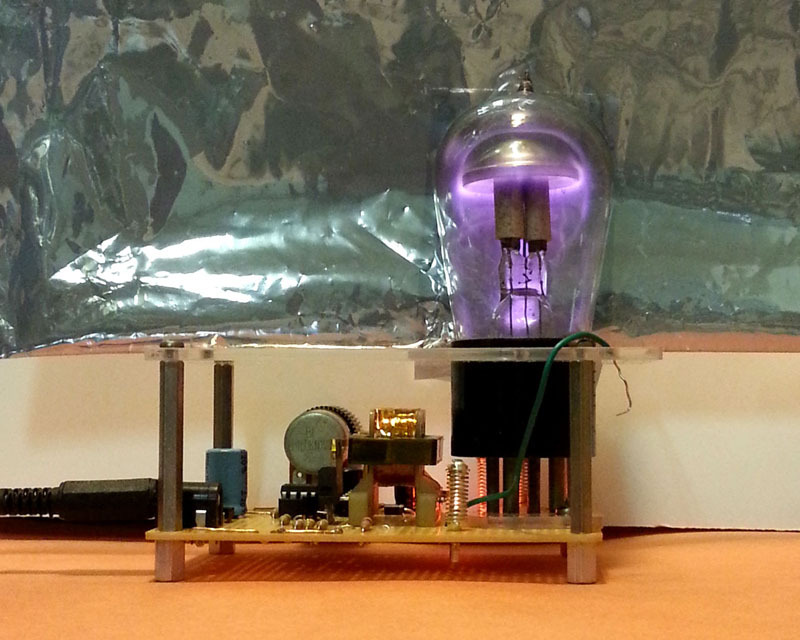 In this example a 12V supply is used, and the cathode filament sits around 6V above common (ground). Only a 1.1V (@200mA) potential is across the total filament, so DC can be used to heat the filament. If the 12V powered CMOS chip is driven from a 3.3V or 5V microcontroller, then a simple transistor level shifter circuit is needed. A transistor, and two resistors, and needed for each shifted signal, rigged in the common base configuration. Don’t try to power the CMOS chip from 5V, in this situation, then its output will never go positive, relative to the 6V cathode bias. Also note that 4000 CMOS, nominally sees a logic-0 input, as any level under 1/3 of its power supply (4V for 12V supply), and 2/3, or over, of the power supply (8V) for a logic-1. Hence, the need for a level shifter. The grids, on this tube, work just like those on any vacuum tube’s control grids. Actual control, is when the grid voltage is negative relative to the cathode, hence the cathode bias. When a grid is negative, it will draw NO CURRENT, and it presents an E-field barrier to current flow from cathode to anode. Here the grid voltage does go positive, relative to the cathode, when ON. It need only get to zero, relative to the cathode. If it goes positive, grid current will flow. 1M resistors are placed in each grid leg, to limit this current to 6uA. Look up how an N-Channel JFET works. Its very similar. High voltage, is only presented to the anode, which is a small conductive contact, on the side of the tube. +1500V is applied here. 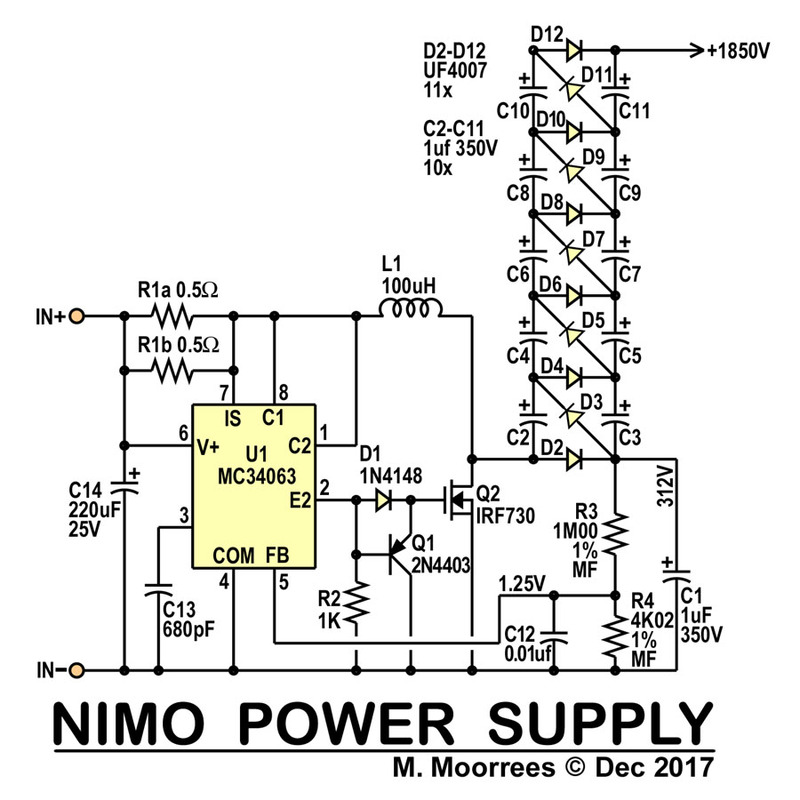 Click Here, to watch a video of a powered up Nimo tube. 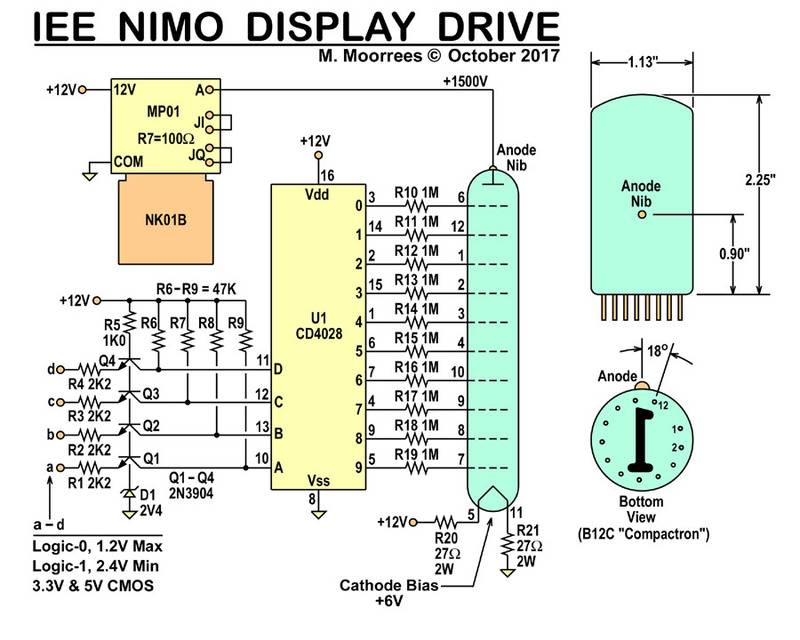 Since, the Nimo is a CRT tube, current is very low. Nominally, less than 100uA, so power draw, should be low. 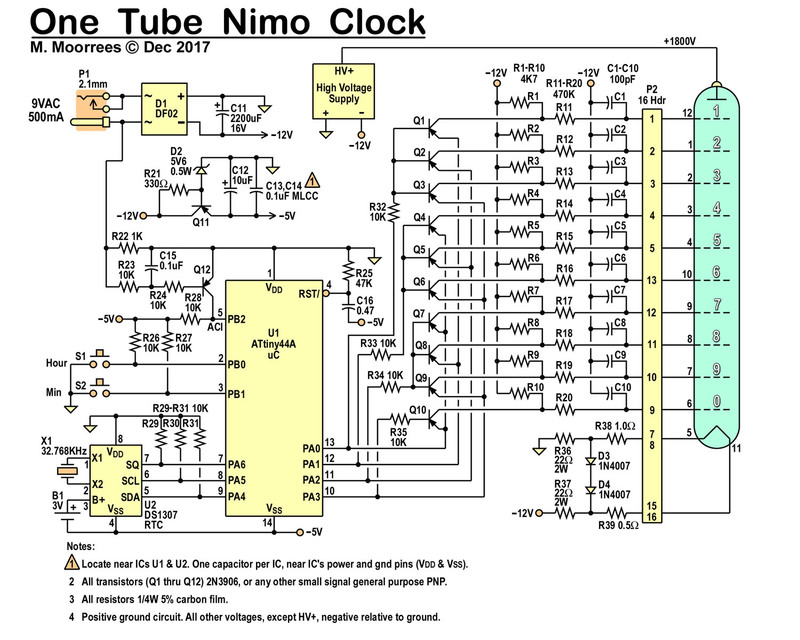 A video of it working can be viewed here – (Nimo Clock). Mine is simplified, by requiring it to be powered by 10V, or higher. 12V nominal. The LT circuit is expected to operate at 5V, but power MOSFETs operate best at 10V (gate to source). C4, C5, R1, & R2 let the inductor “kick” boost raise Vgs above the 5V supply. D1 & D4 zeners clamps the voltage to under 20V (but over 10V), to protect the MOSFETs. The simplified circuit, needs a supply of nominally 12V. The MOSFETs have built-in clamping diodes, in the drain-source legs, to clamp the drain above ground. A 100:1 voltage divider is added. The values of the resistors were chosen to yield an input impedance a tad greater than 1M ohm. Note R1 thru R8 make up the upper leg of the divider. This makes a 992K 2W resistor. several resistors are used instead of one 1M, to distribute both the power, and voltage. Up to 1000V may be applied to this divider. At 1000V, each resistor will dissipate ~1/8W and have ~125V across each part. Note 1/4W metal film resistors have a maximum voltage of 250V, in addition to their power limit of 250mW. Rs1, and Rs2 are shunted in parallel with the meter. The combine resistance is to be 1/99 of that of the sum of R1 thru R8. This works out to ~10.02K. Rs2 allows an adjustment range from 8.9K to 11K. A multiturn trimpot is desired. Trimpots with 10 or 25 turns are available. Instead of using an ohmmeter to set it up to 10.02K, apply a voltage >100V, to the unit working, and connect a good multimeter, in parallel, measuring the same voltage. Adjust Rs2, until the two readings match. 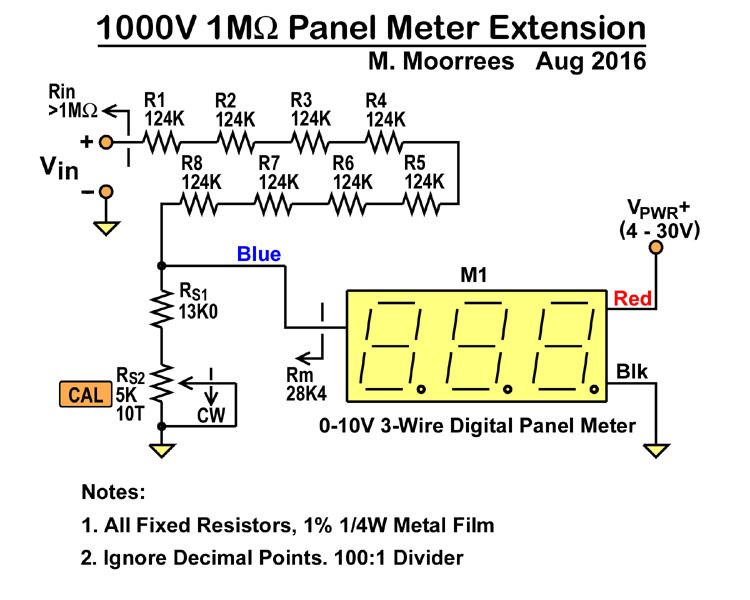 Note: The panel meter is reading 0-10V, while 0-1000V is being applied. That means the decimal point is off. So ignore the decimal point. It is invalid. At the very minimalist level, all you need a two LEDs, a resistor (470 ohm), and a capacitor (0.1uf). You need a certain length of insulated wire, so you can probe between the two points of interest. This wire should be stranded, 24 or 22 gauge, and the probes can be as simple as just the stripped, exposed wire ends tinned with solder. C1 is shown as a 400V film cap, in the drawing, but that allows you to safely test circuits, that may have AC line voltages across them. If you KNOW that voltage will always be at low voltages, a capacitor with lower rated voltage can be used, such as a 50V ceramic. R2 is added so that at least ~150uA is needed to light the LEDs. Unlike old fashion incandescent lamps, LEDs can light up visibly, with very low currents. Even though, an LED is rated for 20mA, it will still light up adequately, at only 1mA, or less. The same can not be said for old incandescents. This is especially true for modern superbrite LEDs, which can be had for pennies. R3 is present a discharge path for C1 (along with R1 & R2), when the probe is not used. R2 & R3 values are unimportant, and may vary widely (-50%, to +100%). S1 is an additional function option. This expands this tools ability to find the circuits polarity, or DC offset polarity, when closed, which bypasses C1. So, if one LED is ON, when the switch is closed, the both ON, when the switch is open, that indicates there is a DC offset greater than the LED forward drop (Vfd), and a signal also greater than it. If this unit is placed across a 9V battery, then only one LED will come ON with S1 closed, and both OFF, when the switch is open.